Natasha Trethewey is former U.S. Poet Laureate and Robert W. Woodruff Professor of English and Creative Writing, and director of the Creative Writing Program at Emory. Former U.S. Poet Laureate and Emory University faculty member Natasha Trethewey has placed her archive at Emory, according to an announcement by the university's Manuscript Archives and Rare Book Library (MARBL). The archive is currently open to researchers. "Natasha Trethewey is among the nation's foremost contemporary voices in poetry," says Rosemary Magee, director of MARBL. "We are so pleased and proud that she has chosen to make Emory the permanent home for her literary archive. Generations of students and scholars from around the world will come to understand more deeply the creative process and the meaning of poetry and its relationship to our lives and history." "Natasha is an extraordinarily powerful and impactful poet, and a deeply dedicated and gifted teacher," says Robin Forman, dean of Emory College of Arts and Sciences. "I am thrilled that her archive will be here at Emory, helping students explore and better understand how the poetic voice can illuminate some of the most critical issues of our time." "Emory has been for me an intellectual home," says Trethewey, "and I am delighted to join the community of writers included in MARBL's fine collections." Trethewey's archive will join a rich collection of literary assets at MARBL, including the papers of Alice Walker, Lucille Clifton, James Dickey, Seamus Heaney, W.B. Yeats, Ted Hughes and Emory University Distinguished Professor Salman Rushdie, among others. Kevin Young, Atticus Haygood Professor of Creative Writing and English and curator of literary collections and the Raymond Danowski Poetry Library at Emory, said Trethewey's archive is “a revelation. It shows not only the origins, drafts and energy of her award-winning work, but also the untold history and profound questions we face. The collection of drafts, early unpublished writings, and even computers will be a tremendous boon to Emory and to scholars and visitors to the archive." 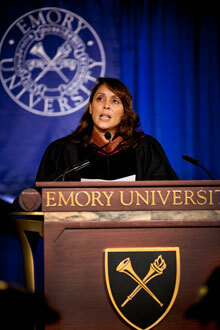 Trethewey, who is Robert W. Woodruff Professor of English and Creative Writing and director of the Creative Writing Program at Emory, was named 19th Poet Laureate Consultant in Poetry by Librarian of Congress James H. Billington in June 2012, and served two terms in the post. Her appointment, which coincided with the 75th anniversary of the library's Poetry and Literature Center, was marked by outreach and travel across the nation. Most recently she completed a months-long series of reports, titled "Where Poetry Lives," for "PBS NewsHour with chief arts, culture and society correspondent Jeffrey Brown. Trethewey, who was inducted into the American Academy of Arts and Letters in 2013, is the author of the Pulitzer Prize-winning poetry collection, “Native Guard” (2006), which Atlanta's Alliance Theatre adapted for the stage this year as part of the National Civil War Project. Other collections include “Bellocq’s Ophelia” (2002), “Domestic Work” (2000) and her newest collection, “Thrall,” published in 2012. Trethewey also is the author of a book of creative nonfiction, “Beyond Katrina: A Meditation on the Mississippi Gulf Coast” (2010). Born in Gulfport, Miss., Trethewey currently serves as Poet Laureate of Mississippi. She holds a B.A. in English from the University of Georgia, an M.A. in poetry from Hollins University, and an M.F.A. from the University of Massachusetts, Amherst. From 2005-2006, she was appointed the Lehman Brady Joint Chair Professor of Documentary and American Studies at Duke University and the University of North Carolina-Chapel Hill, and from 2009-2010, she was the James Weldon Johnson Fellow in African American Studies at the Beinecke Library at Yale University. Among Trethewey's other honors are fellowships from the Guggenheim Foundation, the National Endowment for the Arts, the Rockefeller Foundation Bellagio Study Center, and the Bunting Fellowship Program of the Radcliffe Institute for Advanced Study at Harvard. She has also received the Mississippi Institute of Arts and Letters Book Prize and the Lillian Smith Award for Poetry.